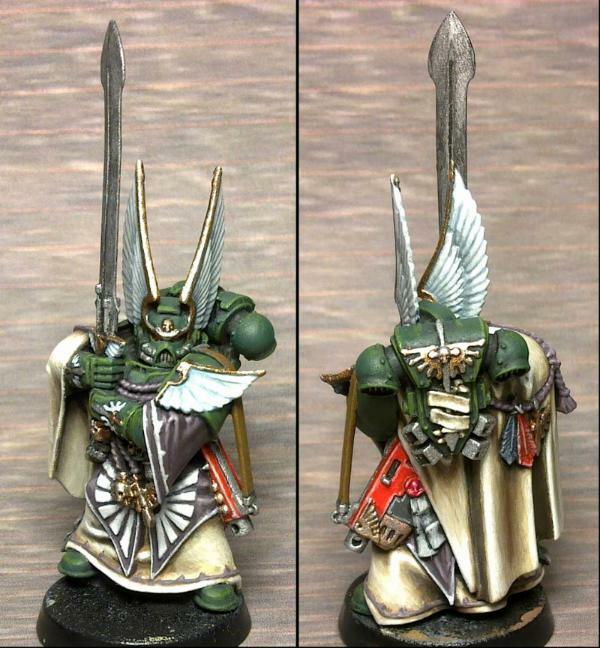 rather strong shades on the cloth.... but they work for me... looks really good... the left arm is still WIP right? Yeah, I wanted to experiment with stronger contrast on folded fabric and was the perfect opportunity. There is still more to do (and has been done since then) on the arm as with the rest of him. What were you seeing (or not seeing) on the arm in particular? The sleeve is purple (although the lower half of it is in shadow there), same colour as his posh loin cloth (with the wings on). The contrast on the photo is a little off though, as the white bits were coming out very bright, so that probably adds to it as well. No worries. I will get better pictures for the final show. Still a bit more work to do on him before the final clean-up sweep. Wow! I'm liking the Company Master a lot. The cloth is much different from what I'm seeing, and I'm glad of it. Usually people do orange shadows on tan cloth, which doesn't really make sense to me. The wings on the helmet are stunning as well. DV dude is coming along nicely, Dr H! Cloth looks great, even if it is a little exaggerated. I've usually been too subtle with my cloth work to date and I've seen quite a few people recently that have done very high contrast cloaks and things and decided to give it a go. Having recently done the Deathwing Terminators in here, and an Eldar Guardian for my army, both with brown shadows to bone to white highlights I didn't even think of doing any different here. I do use a sand colour mid-blend which is slightly orange, but that doesn't dominate the overall colour, just adds a hint of warmth to the cloth. I think the photo is being a little kind to me on the wings, they're a little rough in places. And I've nearly finished all the Dark Angels in the box (just the bikes to do), then I'll start on the chaos models... still not decided what scheme or schemes I'll use for them. The company master is very nearly done. The metals are done, the tidying is done (mostly, the photo has shown that the wing on his head needs a little attention). Maybe, just put the super bright buff on the cutting edges, maybe make the middle of the blade a bit darker, brass bits as Vik says. Like to add, looks bloody awesome. Camkierhi wrote: Maybe, just put the super bright buff on the cutting edges, maybe make the middle of the blade a bit darker, brass bits as Vik says. That's a thought, make use of the paint's matt to shiny nature. Thanks, he's had about 5 and a half hours of "sit down" work on him so far... so he's a faster job than the Librarian (who had over 9 hours of work). Ha, that's the result of a black basecoat, a layer of gun-metal, a quick black wash and then some gentle sanding to smooth out parts... I'll keep that in mind for when I have a "dirty" model to paint. I had a go at getting the metal to "fade" from dull to shiny, but it didn't really work and made the whole blade look dull no matter how much I polished the edge. So I polished the whole thing. You're not going to find a shinier sword this side of a GD nmm job. I also gave him brighter eye lenses. And if none of you can see any issues, we can call him done. Let me know what you think and if there's no issues I'll let you know when he's up on the bay of e.
script arount the bacpack sword i think. Intentionally left blank in case the owner wants to give him a unique name or something to fit in with their army. I did the same on the previous models. If that's the only thing, all is good. Thanks. In my experience, ALWAYS include 'standard' (grit, sand, little bit of static grass or tufts) basing in the commission cost (and definitely photos). The axiom 'faces and bases' should be ringing in your ears any time you're presenting work. Given what you can do, I'd be careful about offering lower level work - it's an incredibly disciplined thing to 'dial back' technique - it's far too easy to just push things a bit because it looks better, but that takes time for which you're not quoting/charging. That's the main reason I don't do anything under 'high end tabletop'. You'll also find that the customers wanting cheap jobs aren't the same guys that will pay for the higher end jobs - so maintaining consistency of that lower level work becomes a key factor in keeping your cashflow going. Thanks winterdyne. Sound advice indeed. I think the greatest challenge for commission painting is getting a good (or even adequate) hourly wage considering the time and effort involved. It's early days yet. I'm still practising with the varying levels (avoiding techniques, etc. ), I'm getting quicker (the Company Master took 3 hours less than the Librarian) and I'm still finding what my painting is actually worth to other people. I'm hoping the casting that I'm moving into will help increase the cash to time ratio a little. He is up and ready to buy. 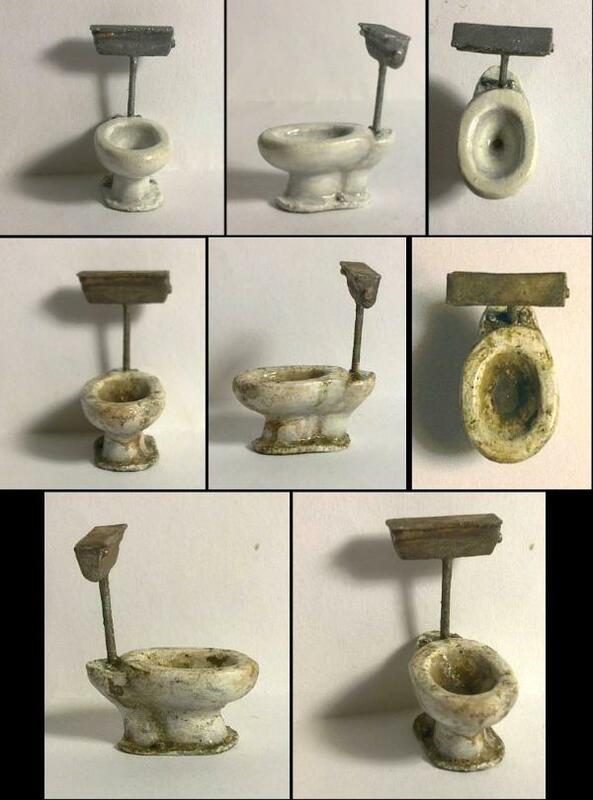 Tiny Toilet (separate/no sprue) - designed to sit up against a wall with no visible cistern. Tainted Toilet (on sprue) - Based on the toilets from the computer game, Fallout 3. Cistern is supplied separate, as shown. Ideal for adding that extra level of detail to your terrain pieces. Box 3 - 22x22x35mm (l, w, h) when constructed. Box 2 - 18x19x23mm (l, w, h) when constructed. Box 1 - 26x25x22mm (l, w, h) when constructed. The boxes are supplied as show here. The individual pieces are thin so that the final box is lightweight and they can be cut to make broken boxes. The sprues of both the toilets and boxes are textured with my unique wood-grain, to encourage their use in your modelling and save on wastage. Contact me via PM to discuss. You mean we can buy them! You are the best. Homosexuality is the #1 cause of gay marriage. Every pizza is a personal sized pizza if you try hard enough and believe in yourself. Basically they went from a carrot and stick to a smaller carrot and flanged mace. You can indeed (just PM me), there are still some in stock. The Company Master is still available. I've not started the next commission piece(s) yet as I'm currently starting up a major project for my army (in my other blog). There will be more soon though. That rules! Wonderfully trashed and unkempt. Sorry I'm so behind but that DA looks sweet man'! That beige cloak is especially well done! Great stuff Dr! bebopdrums2424 wrote: Sorry I'm so behind but that DA looks sweet man'! That beige cloak is especially well done! Great stuff Dr! No worries. Thanks BB, glad you think so. Warboss_Waaazag wrote: That toilet is terrifying. Befitting of the toilets that inspired it.